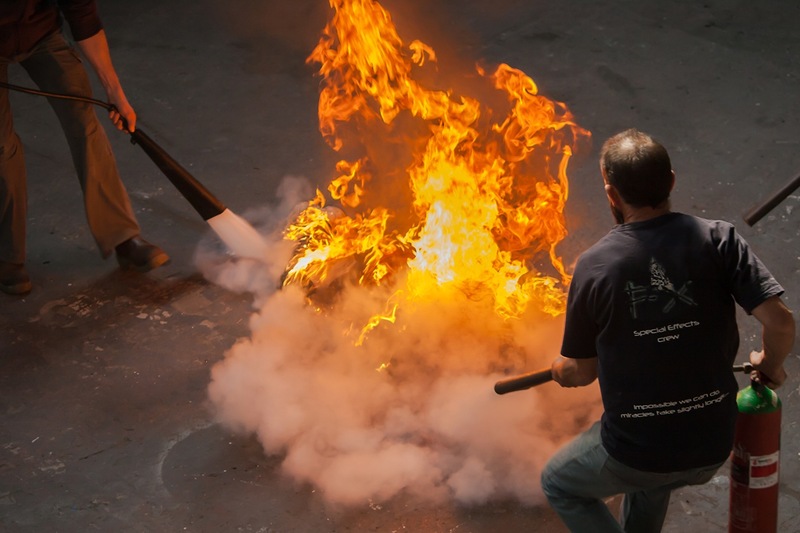 Safety is always paramount when dealing with fire effects, and we always have a qualified Special Effects Technician supervising any and every fire effect we do. Our experience in fire effects is extensive, and means we can handle anything from small fires such as camp fires, beach fires, and interior fire places, all the way to individual burning buildings, vehicles or even burning an entire village set. Fire damage can be limited to a minimum in cases where repeated burns are required. Backpack Flame Projectors are fabricated in-house, and our Dante Package is perfect for creating large vertical flames with black smoke. We also have Flame Projectors that use a DMX controller for sequencing of flames if required, as used in rock concerts and events. When dealing with body burns we work in close conjunction with the stunt performers and actors to make sure results are delivered with no compromise on safety, be it a partial or full body burn. We are instrumental in these body burns, offering workshops and training in collaboration with stunt companies.